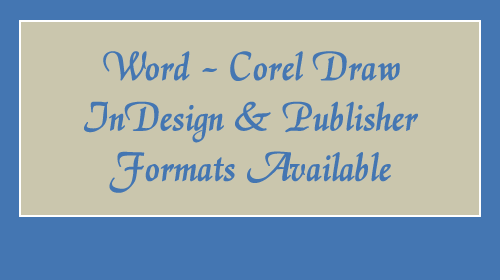 Free postcard templates in favorite formats including Word, InDesign, Publisher and Corel Draw. 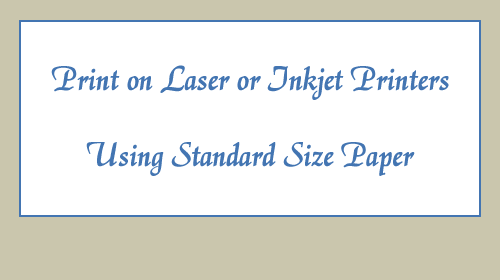 Specially created to fit Avery 4 1/4" x 5 1/2" 4-up pre-perfed paper that is widely available. The back side of each card is blank which leaves plenty of space for additional messages, photos, coupons or whatever you would like to use the space for. 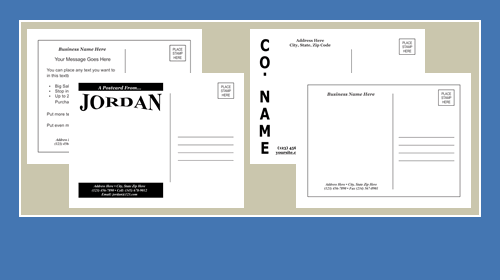 A postcard is simply a thick piece of paper, usually rectangular, although other shapes such as square are common. 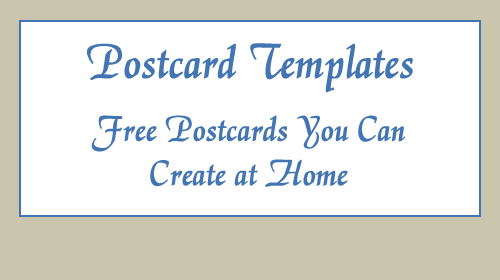 A postcard allows you to write or print and then mail without the use of an envelope. According to Wikipedia, the first known postcard was sent in 1840 in London, England and the first known card sent in the United States was in 1861. The first commercially produced card was created in 1861 in Philadelphia. These days they are used by companies worldwide to sending advertising messages to the masses. How many advertisements have you received by mail lately? 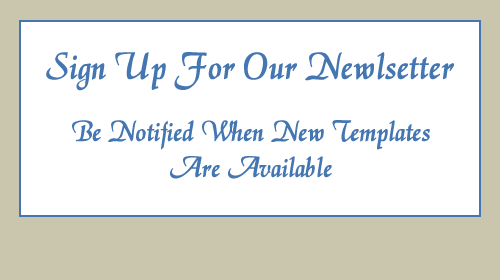 Other popular uses include sending invitations, announcements and appointment reminders. There are no real set size standards for a postcard. You will find them in many sizes (in inches) including 4 ¼ x 6, 7 x 5, 9 x 6, 8 ½ x 11 and many more. For DIY’ers, popular Avery card sizes include, 4 x 6, 8 ½ x 3 and 5 ½ x 4 ¼ and come pre-perforated, which means you print the card, fold and tear apart. 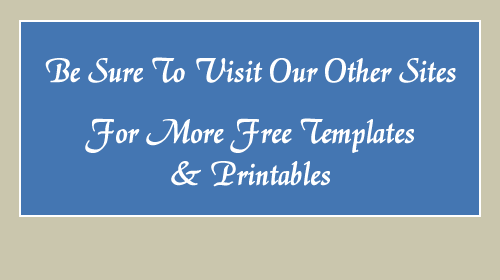 Our templates are made for the last size, 5 ½ x 4 ¼. Creating your own card is perfect for projects that require small quantities. If you require larger quantities (1,000 or more), there are numerous online printers that can print full color postcards at a very reasonable price. Most of these printers offer online card creation tools that are pretty good. When creating your card, keep the end customer in mind, the offer is the most important part, not the design. Just make sure the design ties in with the offer or at least compliments it. Motivate your customer to act on your offer. Another important aspect to consider when sending cards is the mailing expense. 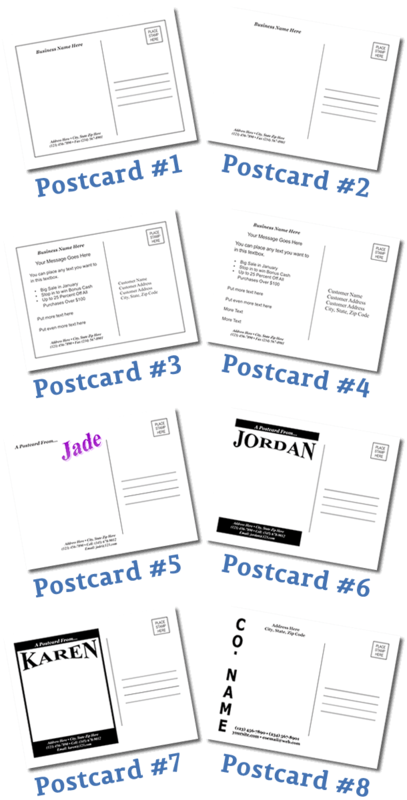 As of this writing, regular postcards cost 34 cents to mail. A regular card according to the US Postal Service must be at least 3 1/2 inches high by 5 inches long and must be 0.007” thick (think index card thickness) and can be no more than 4 ¼ inches high by 6 inches long and 0.016” thick. When planning a mass mailing, always check with your local post office first for pricing options. 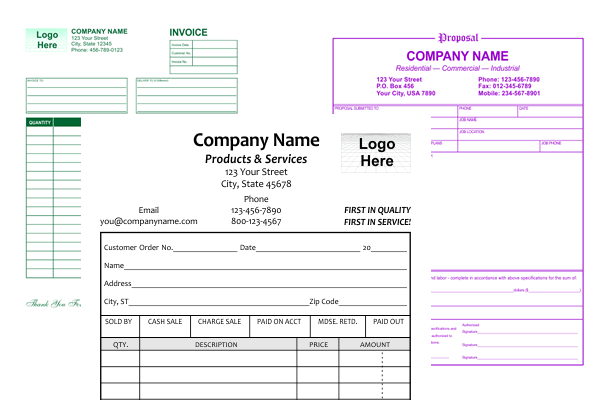 Business Forms: including invoices, proposals, order forms, receipts and more.